We did it. After months of our hard campaigning, last night European leaders reached a deal that requires oil, gas, mining, and logging companies to publish the payments they make to governments. Previously, these payments were made in secret, fuelling corruption; but this victory will help promote accountability. Now citizens will be better able to ensure that the money generated in resource-rich countries is used for vital services like schools, roads and hospitals. 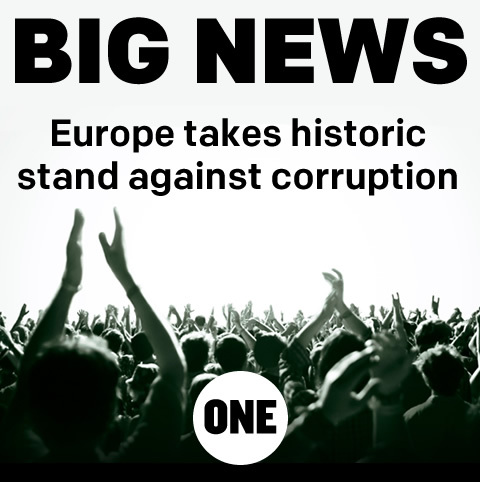 This deal is a historic milestone in the fight against corruption and your actions made all the difference. More than 162 000 petition signatures; more than 8000 postcards and countless handwritten letters and tweets all made sure our voices couldn’t be ignored. Help us spread the word that change is possible by shouting about this incredible news. Share this graphic on Facebook, or share our celebratory tweet. And it wouldn’t have happened without you. Thank you again.